(ICTVC) - June 2007, Thessaloniki, Greece. 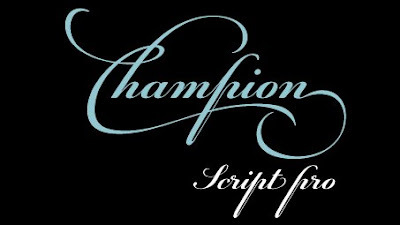 PF Champion Script Pro is the most advanced and powerful script ever made. Developed over a period of two and a half years, each one of the 2 weights is loaded with 4253 glyphs (now 4280 glyphs), offering simultaneous support for all European languages based on the Latin, Greek and Cyrillic scripts. The decision to develop such a typeface was taken during my trip to London back in 2001, while doing a research at the St Bride Library. 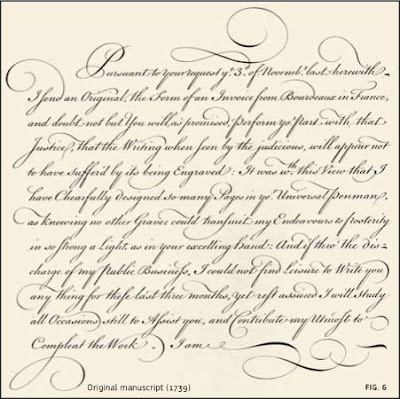 It was then that I came across some beautiful 18th century manuscripts written by English calligraphers. I was particularly impressed by the writing of Joseph Champion, somebody whom I had never heard before (fig. 5). 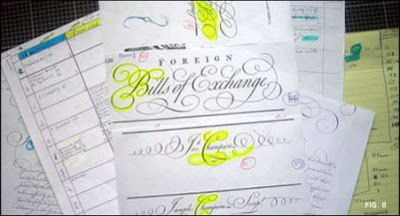 Being myself a self-taught type designer and not a calligrapher, the idea of pursuing such a task seemed at the moment unattainable. Nevertheless, it haunted me for at least three years before the project got started. Joseph Champion (1709-1765) was born at Chatham in 1709 and was educated partly at St Paul’s School and partly at Sir John Johnson’s Free Writing School in Foster Lane under Charles Snell to whom he was afterwards apprenticed. Champion contributed no fewer than 47 plates to Bickham’s Universal Penman. His most important work, “The Parallel or Comparative Penmanship Exemplified”, was published in 1750. The Parallel consists of reproductions of the work of foreign masters like Materot, Barbedor, Van den Velde, Perlingh and Maria Strick, with corresponding plates by Champion. Following these plates come some alphabets by Champion. His last published work was “The Penman’s Employment”, 1762. 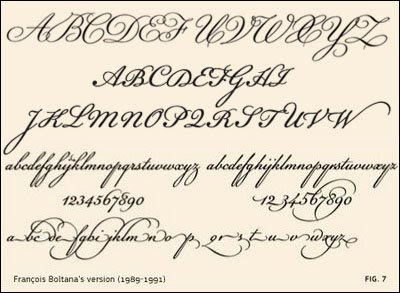 The first known attempt to decode Champion’s writing, was done in 1989 by the French typographic designer François Boltana. Later, in his published paper “Ligatures & calligraphie assistée par ordinateur” (1995), he proposed a couple of alphabets, based on Champion, with a minimal set of alternate glyphs (fig 7). These did not really make it into a commercial font as he passed away in 1999. 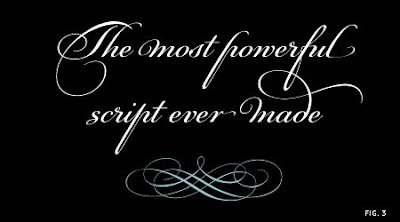 The development of Champion Script Pro started in 2004 with the intention to design a contemporary typeface with classic roots which, for the first time, would be able to fully support three major scripts such as Latin, Greek and Cyrillic, as well as document at the same time alternate glyphs and ligatures (for all three scripts) never before released. The result of this project I present to you today. Three basic requirements became clear right from start. 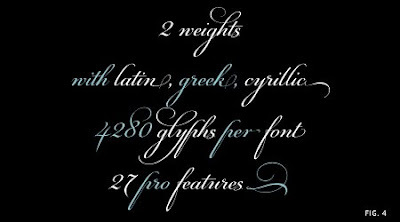 The new typeface would have to loose its deep classic calligraphic roots and instead acquire a clean contemporary identity; retain the handwriting elements without the mechanical repetition of identical glyphs for the same character and finally, apply similar design aesthetics to Latin, Greek and Cyrillic, without compromising the domestic characteristics of each script. The intention was to design this typeface in a way that works equally well for a variety of projects from music, fashion, lifestyle to business, communication and life’s best. Selection Tables. During this stage a number of tables was created which documented all possible versions of characters which were numbered (fig.8). Later on, the dominant glyphs were chosen and highlighted in order to be used for the basic alphabet. Several others were dropped from the list whereas the remaining were used as alternate forms. Uppercase. The list for uppercase letters was passed on to my two assistant designers George Lygas and Sophia Kalaentzidou who put together all the glyphs that were chosen from the manuscripts for each character and prepared them for digitization (fig. 8). Sophia run the initial digitization process, made corrections and passed it on to George for further adjustments based on above guidelines. Finally, they were sent to me for the final adjustments which were performed when most glyphs were put together as a font. Figure 9 shows the resulting glyph for “A” from the original which sits in the background. Lowercase. Meanwhile, I was busy designing the lowercase glyphs. It was realized right in the beginning that instead of digitizing lowercase characters from the manuscripts, it would be easier for me to set them up right from scratch. So starting with letters like “o”, “n” and “i”, I built the basic letterforms and afterwards I designed the rest, based on the initial guidelines and a visual reference of the original. A key point, is to set, right at start, the spacing of the characters for proper interlocking between the letters (fig. 10). After all 26 characters are completed, will begin the long process of proofing. 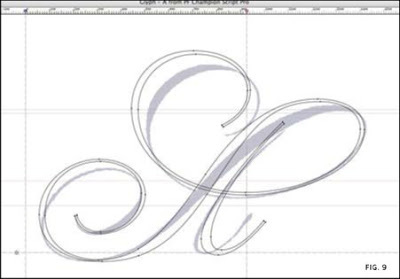 Appropriate corrections will be made to the shape of the glyphs so they harmonize in form & weight. Endings / Beginnings. 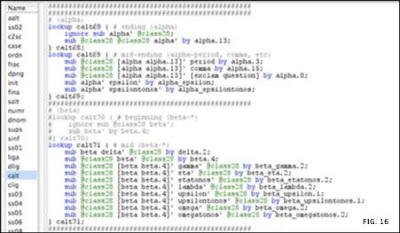 A special list which was created in stage 1, documented a large number of swashed endings and beginnings for lowercase characters. By incorporating the information from this list into the original lowercase characters which were designed in stage 3, I created several new glyphs to be used as alternate initial and terminal forms (fig.11). Small Caps. Small caps were created during this stage. These are not scaled-down versions of the capitals -just like the ones we see in other fonts- but rather small and simple capital forms, whose main purpose is to replace the capitals which disrupt the flow of text -when used within a sentence- with their extravagant swashes. Furthermone two more sets of stylistic variant small caps were created to be used within a sentence, in order to connect words which are separated with space, thus creating the effect of a continuous text flow (fig. 12). Alternates. Hundreds of alternate glyphs and ligatures -for Latin, Greek and Cyrillic- were created either based on the original manuscripts, or right from scratch (fig. 13). Ornaments. 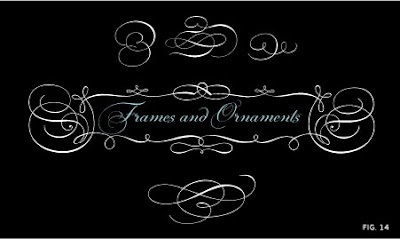 A total of 117 ornaments/frames were digitized (mostly done by George and Sophia) and incorporated into this typeface (fig. 14). Kerning. 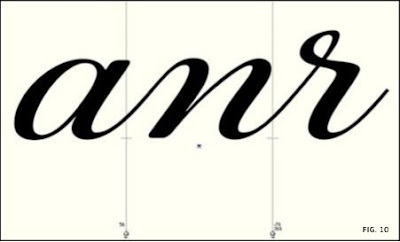 Best designed calligraphic typefaces don’t need kerning. There are a few exceptions though, as is in the case of Champion Script Pro, where there are several occurences of letters which do not interconnect and kerning had to be applied (fig. 15). Programming. This involves the automatic replacement of a glyph into an alternate form, which either looks better in a certain sequence of characters, or avoids clashing with neighbouring glyphs (view sample here). This was a painstaking process as specific parameters had to be taken into consideration, such as possible neighbouring characters, frequency of occurence, etc (fig. 16). Furthermore, many groups of glyphs were established in order to facilitate the manual selection of alternate forms. Finally, several more opentype features were incorporated into this typeface, in order to manage its vast array of glyphs. Bold weight. After completing the design and programming for the regular version, it was decided to complement it with a bold version. Initially, the lowercase glyphs were designed using as reference the regular version and the rest just followed. In conclusion, PF Champion Script Pro exceeded my initial expectations. What I presented to you today is the first version which is expected to be released right after summer (2007). I consider this being a typeface which evolves with time, as new ideas and comments from colleagues and users come through. Thus, a second release is due sometime at the end of the year and a third is planned for early 2008. Thank you all !! Αναρτήθηκε από parachute® στις 2:28 π.μ. I am using this typeface for no more than a week. I still can believe how rich it is, how many different combinations I can create and what quality work it can produce. This is a great work, Panos. 3 Μαρτίου 2008 - 1:02 μ.μ. 4 Μαρτίου 2008 - 5:06 π.μ. amazing font, i can't imagine working on one font for almost 3 years... you've got some dedication and perseverance there! 4 Μαρτίου 2008 - 7:21 π.μ. 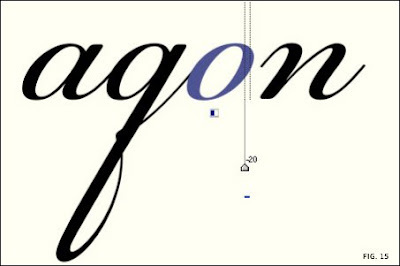 Hi, thanks for posting the development of the typeface, it's beautiful! 4 Μαρτίου 2008 - 8:22 π.μ. THIS IS GORGEOUS. I am trying to get a project that will justify my buying it, because I want want want it! 12 Ιουνίου 2009 - 5:26 μ.μ. Thank you for sharing Great and informative article with us. it is super cool typeface. 30 Ιουνίου 2011 - 11:00 μ.μ. Parachute® landed in 1999, but it wasn’t till 2001 that it started operating as a full-scale type foundry. By then several designers had joined in to form a select group of open-minded, free-spirited individuals/friends. Graphic designers, illustrators, educators, typographers, with fresh ideas and a strong desire to design sophisticated typefaces which reflect current cultures and trends. The year 2003 marked the beginning of a new era for Parachute® with the release of a major 200-page catalog, which contained Greek and Latin typeface specimen. This catalog/book included several classic revivals of historical importance, as well as many original font designs. Since then an emphasis was placed on multilingual support and OpenType® technology. 'Archive Pro', an award winning typeface, was first released in 2004. Obsessed with type? Yes, we are! !